I’m back from a mini vacation! We took a few days off to visit the other side of Florida and drove to Miami for some good food, more sunshine, more beaches and shopping. Several of my readers let me know about the Glossier Pop Up Store in Miami so we stopped by to check it out. It is one of the cutest pop up installations I’ve ever seen! It’s located in Wynwood on 222 NW 26th Street, open until April 28th. Hours are listed on the Glossier website. There are a lot of testers for you to play with, helpful staff and it’s basically an Instagram dream come true. Cute displays, mirrors for makeup application and selfies, postcards and the entire Glossier + Glossier Play line. Weekends can get pretty crowded and busy with a line but they move fairly quickly. We went to the pop up on two separate days because our first time there it was so crowded I didn’t want to wait to check out and purchase product. Mini haul below including the Glossier Zit Stick, new Mango Balm Dot Com, Lash Slick, Glossier Play Niteshine in Pale Rose and Deep Copper, High Shine Lip Lacquers in Pony and Blow Up. I also tested their Milky Oil which seemed pretty impressive in taking off the eyeliners from the back of my hand. Unfortunately they were sold out so I ordered it online. I haven’t had a chance to test the makeup but the highlighters are tiny – they girls at the store explained they are dab and blend kind of highlighters and that does seem the best way to apply. A little goes a long way. I did try the new Mango Balm Dot Com and it has the most delicious sweet mango scent to it. I didn’t think I would like it because it’s really sweet, but I actually really love it. Swatches of the makeup items I bought. I actually had a third highlighter on my list but they accidentally gave me two of the same shade. I’m giving away my extra (details in the widget at the end of the post). We also saw the cute Mango Pop Up cart in the Miami Design District! You can check their Instagram to see where it’s going to show up next. On our second trip to the Pop Up we saw they had moved these to the actual store in the hallways but they might move again. Definitely worth checking out! It’s super cute and fun to see all the items in person. If you’re not near a store you can always order online (that’s how I’ve always bought their products). If you want to use my referral link you can save 10% off your first order. I have some extras that I picked up so I’m giving away some goodies to 1 lucky reader. Open internationally but you must be 18 years or older to enter. Enter through the widget below. Giveaway entries are going to run through April 7th, 2019 11:59 PM EST. ONE winner will be selected within 72 hours after giveaway ends and emailed by me. Prizes ship within one week. Not sponsored or affiliated. To recap, the Glossier Miami Pop Up is going to be open in Miami through April 28th. Hours are on their website. 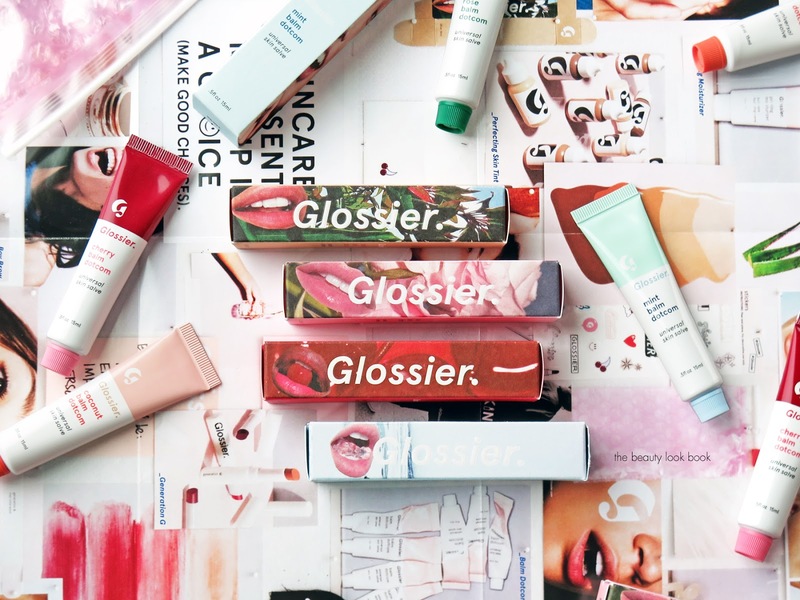 Have you been to any of the Glossier Pop Ups before? If yes which ones? More on our Miami trip, packing + outfits to follow! Lots of you have been asking about all the sandals I’ve been wearing and I’ve promised to share everything I wore with size info soon. Mint is a clear shade that has a very nice mint flavor and scent. I find mint hit or miss – yes it can be refreshing and cooling, but some scents or flavors are ones I don’t want to wear. Mint is one that can have a toothpaste vibe which I like for toothpaste, but not to wear. Luckily the Glossier Mint is one of the good variations. Rose has a soft rose scent that isn’t overpowering and isn’t overly sweet. This one has a soft pink tint but after a few minutes it basically looks clear. It feels smooth and lush on the lips. Cherry smells exactly like a candied cherry and has a cool-red-pink tint that shows up on the lips like a soft stain. I personally do not like cherry at all (I won’t eat anything with cherries or cherry-flavored) so this one is a no-go for me. I’m not sure if it’s my aversion to cherries that affected my opinion on this one but I felt this one to be on the thick side – and not in a good way. Coconut is one I reviewed when it launched last year. It sold out quickly and was out of stock on their website for months. I thought it was a limited offer and would never come back but I’m glad that it did. If you compare the old post to this one and look closely you may notice they changed the packaging slightly. Now there is a longer tube with more product but the overall design is pretty much the same. Formula-wise these are described as universal skin salves that you can use on lips, face, cuticles – basically anywhere you have dryness. These have a medium to thick texture that I prefer to use on the lips or cuticles only (I haven’t been brave enough to test on the face). They add moisture to my lips and because the flavors are fun (cherry excluded) I don’t mind reapplying. If you’re one who doesn’t like reapplying product or if you want something more intense, I do think the Bite Beauty Agave Lip Masks are better – but the ingredients, concept, packaging and purpose is completely different. 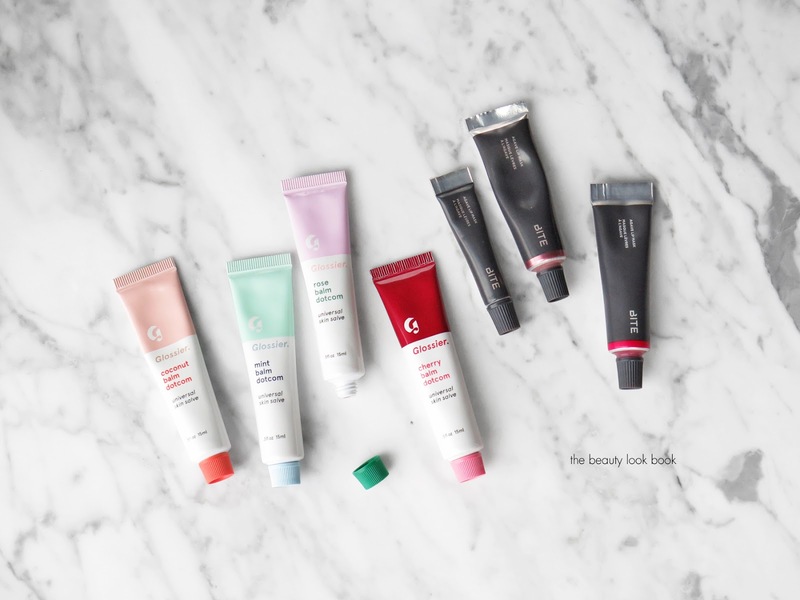 The Bite Beauty Agave Lip Masks are designed to be a leave-on lip mask and they don’t have any petroleum (while the Glossier products do). They are also more than two times the price (but I don’t mind). Below a look at Champagne and Smashed reswatched on the lips. I do think these are worth it. I love the packaging, the marketing and the cute zipped pink pouch they come inside. When you order these from Glossier the box it’s shipped in is also very cute, but I have a lot of appreciation for little fun touches. Things like a simple printed interior of the box with fun branding and cute sayings, adorable stickers (even though I won’t ever use them, I gift them away) and extra touches on the actual product boxes all get me excited. Even though the boxes are a throw away kind of thing, I still like them. If you’re budget conscious and also ingredient conscious (or perhaps as some may say more practical and less frivolous) then stick with your staples and what you love. I really like the new launches, but my heart still belongs to Coconut because it’s like summer fun in a tube. Out of the new ones, I was surprised to find I really liked Mint because I’m really not a fan of mint-flavored beauty products. Rose is also really lovely. Cherry is a no-go for me but that’s primarily because I don’t like cherry anything (lemon or blueberry would also have been a no-go for me). 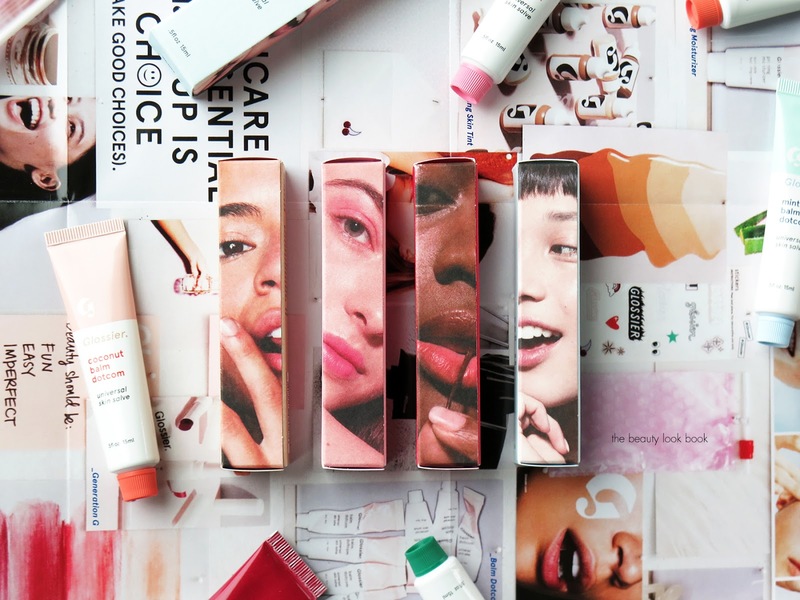 You can find the Glossier Balm Dotcoms in four flavors, Coconut, Rose, Mint and Cherry for $12 each. Right now they have a Trio Set for $30 (with Rose Coconut + Mint) which I believe is a limited-edition offer. If you click this referral link here you can save 10% off your first order. At this time I believe the only place you can buy these is directly on the Glossier website.